OK fellow SIXXXXER fans...as promised, here is the pictorial and some tips/instructions for the install of my new armrest. This is kind of long, but if you are interested in doing the same, it may be helpful. I will put all of the instructions right here, followed by all of the pictures. If you have any questions, email me and I?ll give what info/help I can. I think that the color match could be a little better, but it is not too bad. I ordered this kit from Bavarian Auto Sport?.$168.90 including shipping. If you do want to order one, be sure that you have the color code and name for your car handy. My color code was silver leather 0201HL and yours should have similar a color name and number. If you don?t know what your codes are, call a friendly BMW dealer with your VIN and he can tell you. If you want to see how this looks in person, I will be at the PSF next Friday evening and Saturday. Say hello! SEE YOU THERE! These steps are pretty much in line with the instructions that came with the kit and you should primarily refer to them, but I will throw in some things I found helpful. NOTE!!! 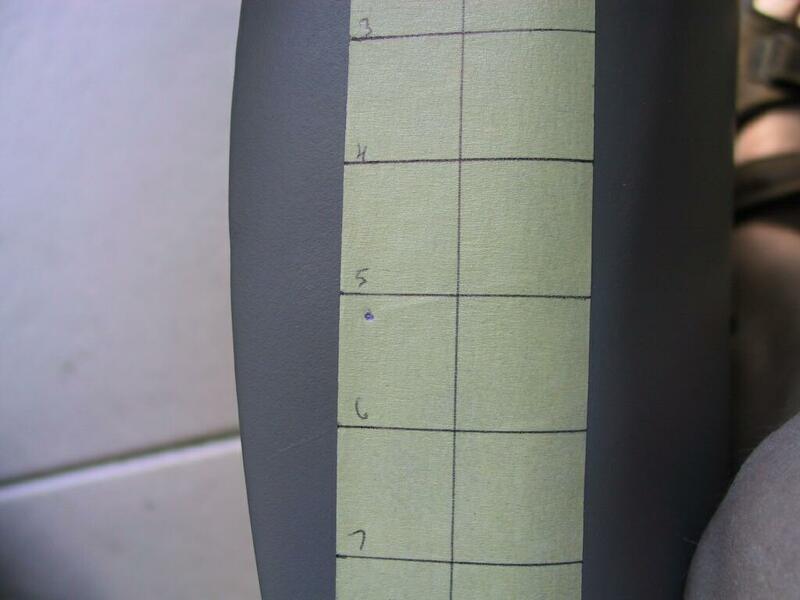 Before removing the seat back, I made up a couple of wide strips of masking tape and marked them off in one inch grids. I stuck one on the leather on the right hand side of the driver?s seat and stuck the other VERY close to the first, but on the seat back that is going to be removed. With the two pieces of tape arranged carefully in relation to one another this gave me a grid to use as a reference later when figuring out where to drill the hole as I didn?t want to screw it up and I also wanted to make my hole three quarter of an inch as opposed to the one inch in the instructions in order to not have such a big hole in the side of the seat. The smaller hole gave me a lot less "slop" or "room for error" whn putting it all back together. A shot of the parts prior to starting the installation. Step 1. Remove the seat back as in the instructions. I removed the plastic cover from the left seat pivot to give better access and more maneuvering room when putting the seat back on again. You might as well just go ahead and bend the little lever for the seatback release rearward about 30 degrees right now while you are there. It will have to be bent back to get the seatback on again, just like it says in the instructions. Step 2. 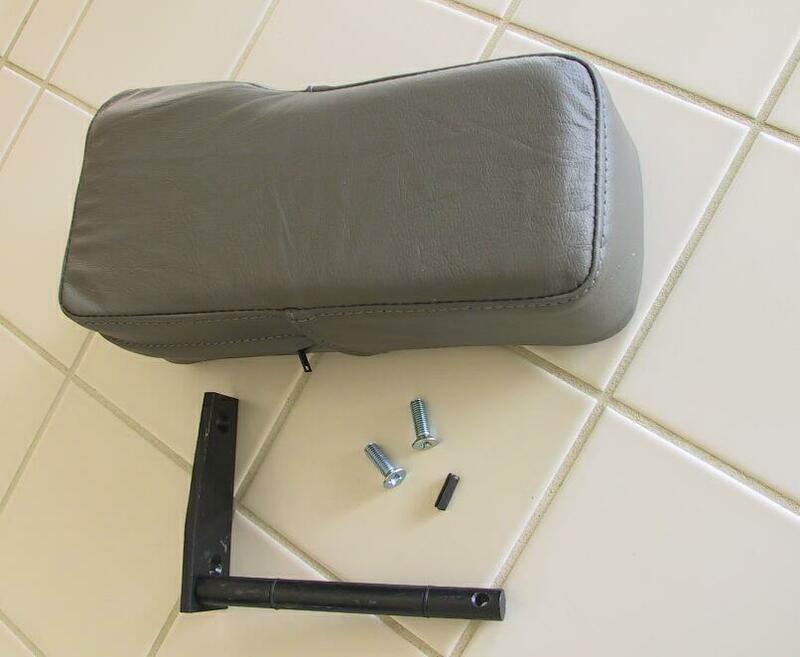 Remove the 2 screws from the side of the seat and install the bracket with the screws in the kit. (see the tape?) Note where the center of the pivot is on the tape. Step 2A. 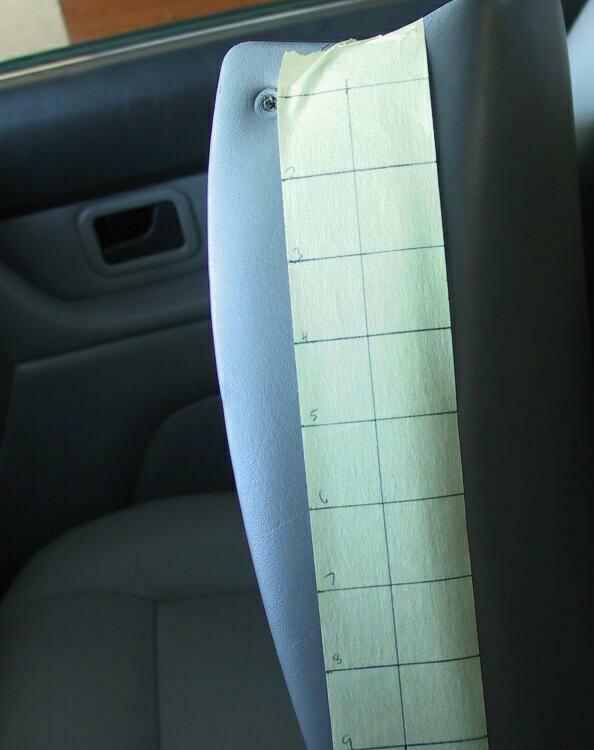 This is a picture of the tape that I applied to the seat back before I ever took anything apart. Step 3 and Step 4. 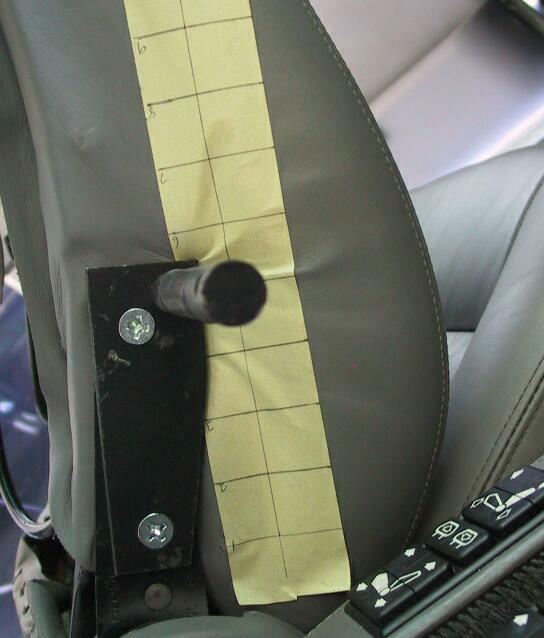 CAREFULLY measure and figure out where the hole has to go in the side of the seatback. 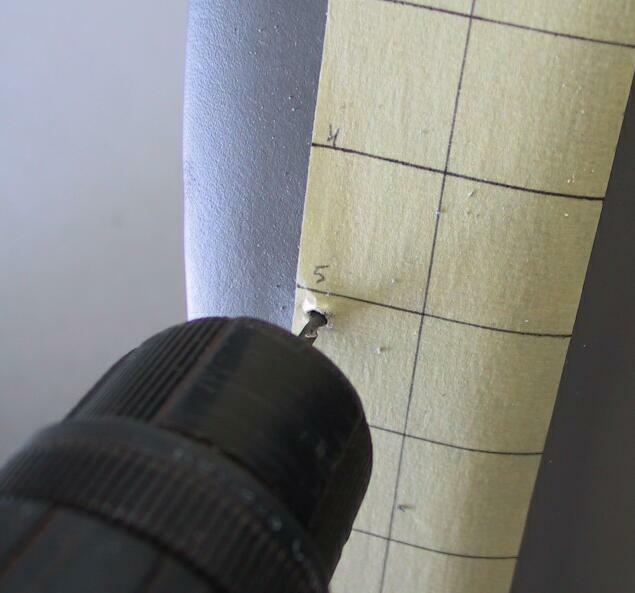 Drill a small pilot hole carefully through the leather and the fiber material and remove the tape. Step 5. 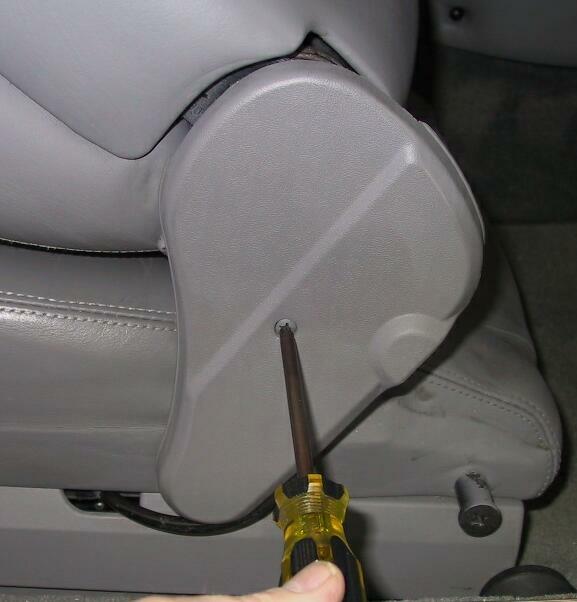 Now, from the INSIDE of the seatback, using a hole saw or a wood bit, CAREFULLY drill your hole. I made mine three quarters of an inch, but the instructions call for one inch. Your choice?how accurately did/can you measure the right spot? I was careful to only drill the fiber material and NOT all the way through or in to the leather on the outside of the seatback. That way I could have some material to tuck in around the pivot bracket later so the hole wouldn?t look so crude. Step 6. CAREFULLY cut an ?X? 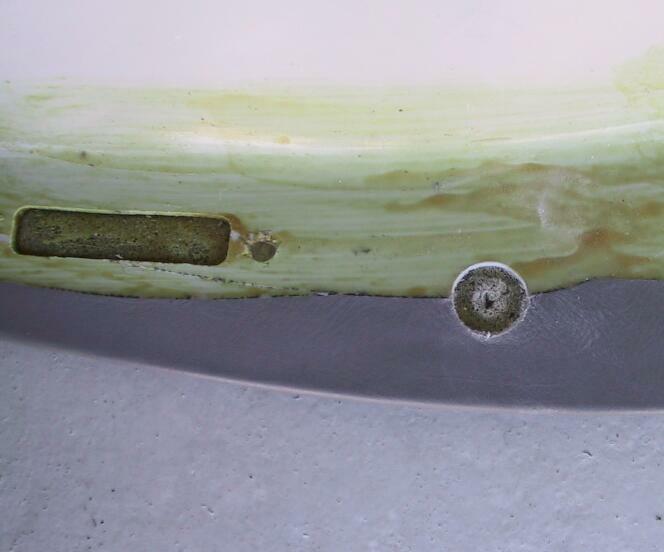 in the material over the hole so you can get the pivot through and then tuck the material in around it. Step 7. Slide the hole over the pivot and reinstall the seat back. It is kind of a struggle to get the seatback latch to go back into the hole, but if you did bend the lever it will go if you CAREFULLY also bend the side of the seatback outward a little. IF you got all your measurements right the seatback should wind up right in the same spot is was and all of the rest of the holes for screws and the seatback latch should line right up. If NOT?note which way it is off and by how much. Remove the seatback and CAREFULLY file the hole for the armrest pivot to get it moved over to the right spot and reinstall the seatback. 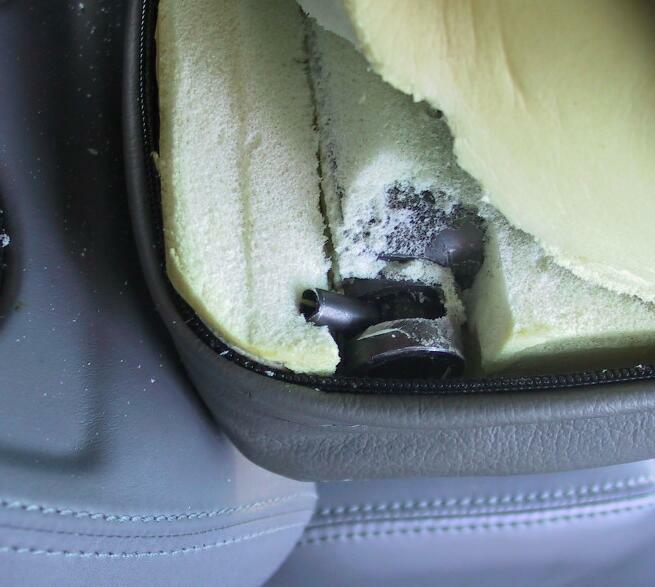 Once it is all back on, use a small screwdriver to neatly tuck the leather material into the hole around the pivot. Step 8. As in the instructions, unzip the cover of the armrest and be sure that you have the slot in the end of the pivot lined up then tap in the roll pin. Step 9. Zip it up. You are all done! The whole deal took me about an hour and fifteen minutes to do. Probably less time than it will take me to get all of this put on the computer and added to the E24 Forum! As you can see the color match is pretty close, but could possibly be s a little better. I like the armrest to be a little lower, so I think I will go back in and carefully lengthen the slot that the roll pin goes into so that it will let the armrest go a little further down before it hits the stop. This looks like a pretty good job, and a comprehensive post. However, many sixes out there (eg mine) have the earlier leather seats and different (simpler) trim. Plus maybe we don't want to put holes through the side of the seats. 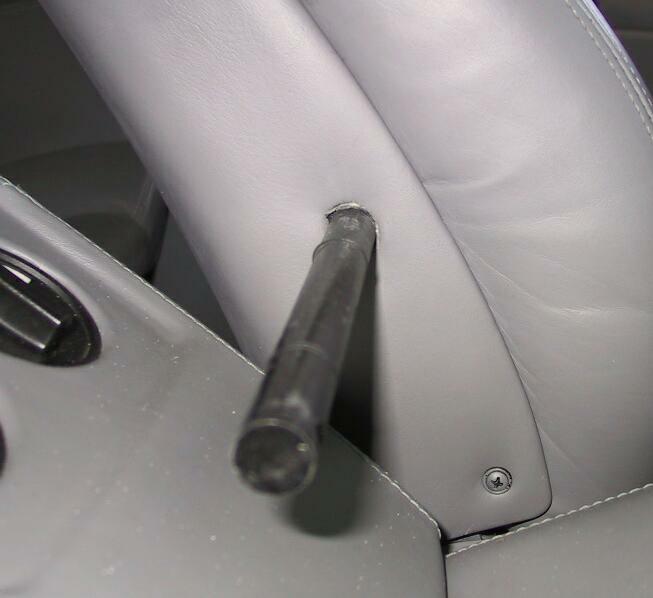 So, does anyone know of an armrest kit that mounts on the rear part of the handbrake trim/centre console? I was planning on mounting an armrest here, perhaps through the (unused on my car) holes (for switches). Has anyone seen or made such a thing? thanks for the tutorial, but I, too, would like to find one that attaches to the back of the handbrake console. Anyone out there has found one? I'm thinking of doing this a similar way, but with a different armrest! Well two off. The principal advantage is that they can be stowed when not required. On the E34 (not all models) you can get individual arms which use a form of ratchet to set at different heights. See picture below (our 95 E34 520-ff extra) where they are in upright mode & HERE, ITEM 1. As for the color match, you might want to contact Joanne at www.colorplus.com, she can mix up a small can of dye color matched to a small leather sample you can cut from inside your seat. You'll be pleased (no affiliation, just worked well for me). Brucey wrote: This looks like a pretty good job, and a comprehensive post. However, many sixes out there (eg mine) have the earlier leather seats and different (simpler) trim. Plus maybe we don't want to put holes through the side of the seats. Bit of a thread revival, I'd also be very interested to know if anyone has successfully installed a centre console armrest that fits in with the rest of the interior, so looking as OEM as possible, not one of those cheap Chinese armrests available on eBay. 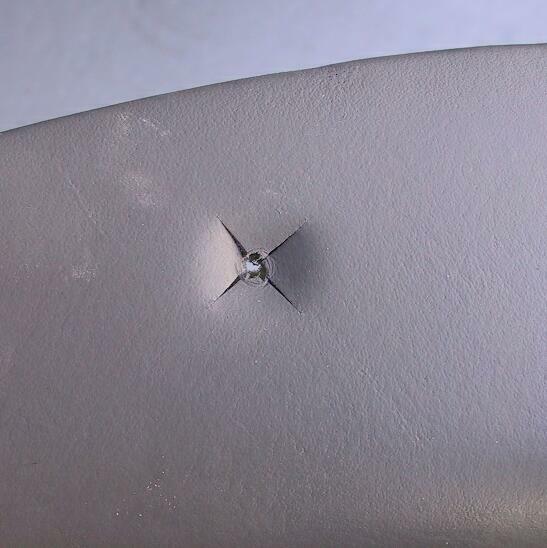 The other option, bolting armrests on to the sides of the seats doesn't appeal, I'm looking for something that doesn't require obvious drilling so that the car can be reverted back to standard easily. Being a luxury cruiser the 6er really missed out on having these! Brucey wrote: So, does anyone know of an armrest kit that mounts on the rear part of the handbrake trim/centre console? I was planning on mounting an armrest here, perhaps through the (unused on my car) holes (for switches). Has anyone seen or made such a thing? I guess it's a case of seeing which one would best fit in-between the front seats, leaving enough space for them to tilt forward and look as natural in the E24 as possible. A storage compartment would definitely be good. 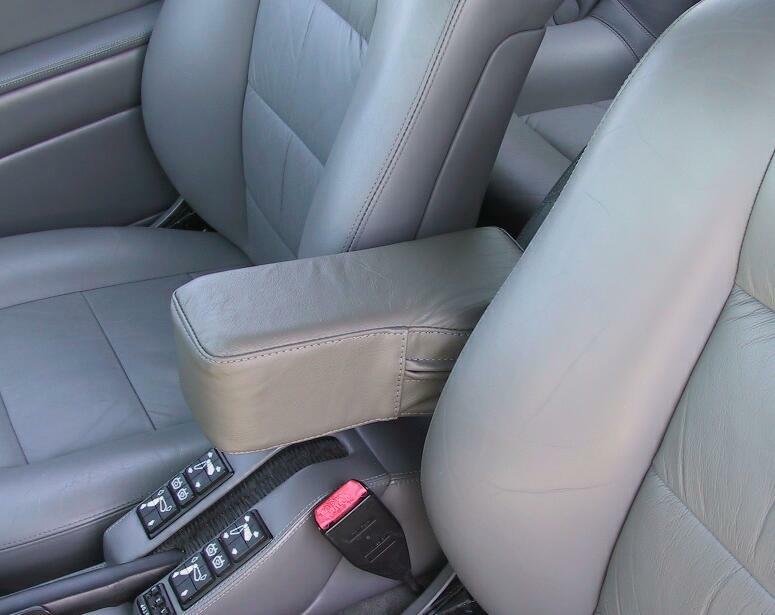 Looking through those on that site, I think an E46 armrest may be the best option? one thing that sent me into 'deep pondering' was the mountings for this. The two screws that mount the rear of the usual handbrake console are attached to some steel brackets, but they seem somewhat flimsy to me. I am kind of thinking that some kind of more secure mounting onto the tunnel itself (maybe welded brackets or some M6 or M8 threaded nutserts through the tunnel?) might be required for a properly secure armrest mounting. One idea I had was to fabricate a steel frame that goes through the extant openings in the console, and then bolts to the tunnel, such that the frame incorporates a hinge for an armrest (or two). Failing that, I guess it has to be a replacement console of some kind (and still problems with the mountings) or a major modification to an original one (ditto). Some good points to mull over there Brucey. For the last point - do you mean keeping the original centre console in place, without hacking it apart but having the support bracket coming through the brushed gap where the handbrake level feeds through? I may see if I can get hold of a second centre console rear section that I can use to experiment with and then keep the original if needed to return it to original. guido wrote: Some good points to mull over there Brucey. my handbrake console has two switch covers to the rear of the top part; beneath these covers there are openings (about 17mm x 35mm IIRC?) which allow access to the screws that secure it. Yours may be different to this..? My rough idea is to fabricate a cantilever bracket with 'L' shaped feet, that pass through these openings and bolt to the transmission tunnel. The bracket bolts would be accessible via the gap between the console (once raised slightly) and the tunnel. Once fastened, the console would be lowered and bolted down (perhaps using the original fixings) and then the armrest would be assembled to the protruding part of the bracket. Alternatively it may be possible to bolt the bracket to the tunnel and then to lower the handbrake console over the top of it. My idea for the armrest itself is to hinge it at the rear (almost as far back as possible) . I'm thinking of an inverted steel box structure for the armrest itself with a relatively thin padding to the sides and a thicker padding to the top. This would hinge upwards separately from (and/or together with) an inner steel box which would be a storage cubby. The cubby could be quite sizeable; maybe 4" x 4" x 12" is possible? I feel this storage would be more than welcome; on AC-equipped cars there is stuff-all storage for odds and ends. One mad idea is to have the floor of the cubby drilled and partitioned so that it works as a cupholder, such that the lower part of the cup hangs out of the bottom of the cubby. In use, the upper part of the armrest would have to be raised to allow access to the cup itself. I'm thinking of magnetic latches to hold the armrest in the upright position. Downsides to this scheme are that the armrest will foul the handbrake (which is probably inevitable) and may get in the way of the gearstick on manual gearbox cars. I'd (loosely) aim to echo the shape and look of the rear centre armrest on the upper surfaces. On the lower surfaces, I'd look to echo the angled top of the original handbrake console, and to use the complementary angle to the side taper to flare the armrest outwards slightly sideways (if you see what I mean). Mine is different being covered in black leather without the switches or switch covers visible from the top, although from the underneath you can see that the switch covers are still there (having removed it to clean underneath), they have just been covered over. but I'm not sure I'd go with the idea of drilling out the floor of the cubby to act as a cup-holder, sounds like a recipe for lots of spillage and disaster, especially when forgetting a full cup is in there and pulling the handbrake rather hastily! 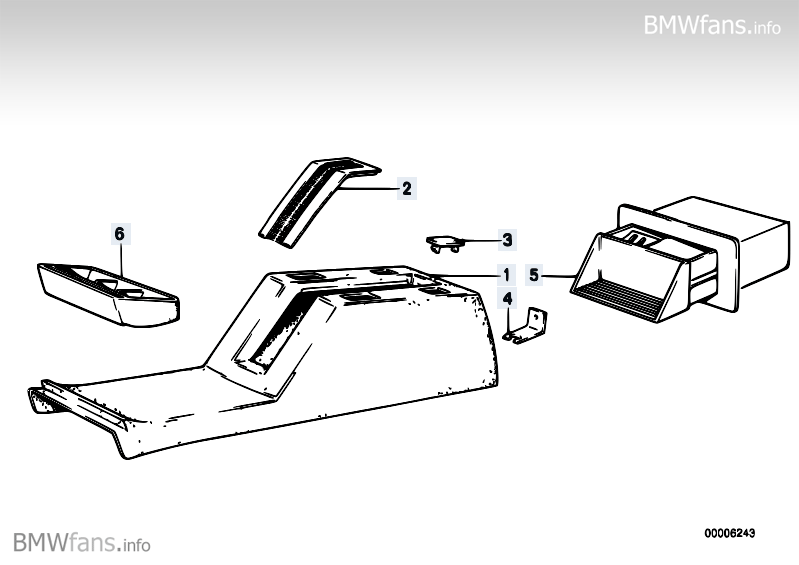 I do like the idea of staying with BMW equipment though for a BMW..
Has anyone had any experience with this company and their armrests? ...or an original HUSCO E30 armrest in Germany for €1,500. Crazy. I have ended up going for this one from an E38. It will need re-trimming and I'm not entirely sure if it will fit yet width-wise but it was cheap enough so worth the gamble. guido wrote: Has anyone had any experience with this company and their armrests? I'll soon know about the Braccioli armrests. I showed it to my friend Eddie, and he immediately ordered one for his E30. Total at the current exchange rate was $115.91 including shipped to the U.S.
Good to hear Ken, will be interested to know how he finds it. Armrest received and I'm very happy with the condition and the amount of storage. It measures 13.5cm height including the bracket, 20.5cm width and 30.5cm length. My initial thought is that it maybe a little too wide to fit between the front seats...but as my car is in pieces and I'm not able to take a measurement. edit: The centre console where the handbrake protrudes is 11cm in width.. I doubt there's going to be 5cm on either side for it to fit...doh. As promised, the Braccioli armrest/cup holder installed. The quality is very nice, the install extremely simple (on an E30...I imagine one in an E24 would be similar). To use the cup holder you must slide the armrest forward, and the opening in the cup holder is rather small, but it's considerably better than not having any cup holder. By the way, the upholstery (seats) was done by Spencer Copple in Semmes, Alabama. Was this the version that only slides forward or does it tilt also with a storage underneath? That one slides forward to expose the storage area/cup holder. The cup holder is easily removed to open up the storage capacity. The whole armrest also tilts up (one of the pictures shows that. The first picture, I believe), but that only exposes the console beneath. I'll try to remember to get measurements next time my friend is close. He's currently in the Columbus and Atlanta areas of Georgia, and won't be back until Thursday. He is very happy with the product. His exact comment was he'd have paid twice as much to get a cup holder and arm rest. With the cushion slid forward to expose the storage area/cup holder 15"
Eddie really likes it, and after riding as a front seat passenger, I like it too, very much. 4.5" wide doesn't seem like much, but it's wide enough for both the driver and passenger to rest their arm there. The only concern: the attachment to the console is somewhat flimsy. Only two self-tapping screws hold it in place, and the point of attachment to the OEM console is not the strongest or thickest piece of plastic. The strength would be much improved by some reinforcement in the console where the screws attach. Ken, many thanks for posting that info. I've admitted defeat with the E38 armrest, it is just too wide and bulky for the 6er, so have ordered a Braccioli one. Ken, did your friend order one in "eco leather" or "genuine leather" ? I believe it was the "eco leather". Honestly, it feels (and smells) wonderful, like real leather. I intend on getting one for my E30.